Can I create a task in task scheduler that starts when a specific battery level reaches on idle computer to go to sleep? Windows does give option to make computer to go to sleep at specific battery level but it doesnt care if laptop is idle or not. 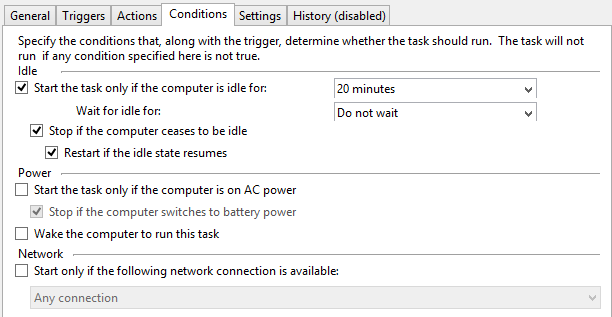 I made a scheduled task that triggers when the computer is idle, and repeatedly runs a batch file that checks if the battery is discharging and how many percent it carries. If the battery is discharging (ie, laptop is not plugged to mains), and the battery is charged 25% or less, it will immediately put the computer to sleep (or hibernate, if it's turned on already). You will find my script below. Not the answer you're looking for? Browse other questions tagged windows automation battery sleep tasks or ask your own question. Should Windows 7 transition Sleep => Hibernating if battery drops below critical? Does “Reserve Battery Level” in Windows perform any function besides the popup? How to stop computer from entering sleep under “Critical Battery Trigger Met” misidentification?